● Lamp: Depending on the application, either High Intensity Discharge lamps (HID) or fluorescent lamps are typically used for indoor growing (Fig 4.1). ● Ballast: This is used to ignite then regulate current to the lamp (Fig 4.2). Ballasts are broadly categorized as either digital, electronic or magnetic. This choice can have a large impact on the longevity, efficiency and output of lamps. ● Shade (or reflector): Lamps require a shade to direct light towards the plants. This usually incorporates the lamp holder or socket. ● Timer: This is needed to switch the lamps on and off. Photosynthesis mainly occurs within the visible light spectrum, wavelength range 400 to 700nm. Within this range, 445nm (blue) and 650nm (red) are needed most. HID’s are generally used for the vegetative and flowering/ fruiting phases of heavily fruiting plants. Their popularity is due to their high lumen per watt rating. They produce ~5 times as many lumens per watt than incandescent lamps. ● Metal Halide (MH): MH lamps produce light that is predominantly ‘blue’ in color. Blue light is ideal for producing strong vegetative growth such as larger leaves and thicker stems. MH is also ideal for producing shorter, dense plants which have shorter internodal spacing. Plants of this shape utilize light more efficiently. 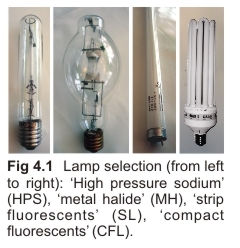 ● High Pressure Sodium (HPS): HPS lamps produce more ‘red’ light. Red light promotes flower onset and fruit production. HPS is therefore more suited to the flowering/ fruiting phase. 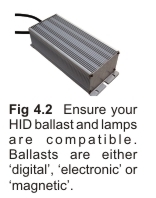 Unfortunately, MH and HPS lamps each require a different ballast and lamp holder. Due to this expense, it is common practice to use a HPS lamp for both vegetative and flowering. This is particularly common if plants have a very short vegetative phase. However, as a general rule, the use of a HPS lamp throughout can promote tall and spindly growth. ● Blended light lamps: To prevent the need for a separate lamp kit for both the vegetative (MH) and flowering (HPS) phases, “blended light” lamps are available. These produce a more balanced spectrum of ‘red’ and ‘blue’ light. Fluorescent lamps produce less lumens per watt compared to HID lamps. Hence, their use is limited to plants needing low to medium light intensities, such as seedlings, clones, herbs, orchids and lettuce. Unlike HID lamps, they generate minimal heat and therefore require little or no ventilation. Fluorescent lamps are broadly categorized as either ‘strip’ fluorescents (SL) or ‘compact’ fluorescents (CFL). They are available in different wattages and color temperatures. Those of high color temperature (known as “cool white”) are more ‘blue’ in color and suited to vegetative growth and the development of seedlings and clones. Fluorescent lamps with lower color temperatures (“warm white”), are redder in color and therefore better for flowering. CFL’s are generally available in higher wattages than SL’s and are therefore suitable for plant species needing higher light intensities.